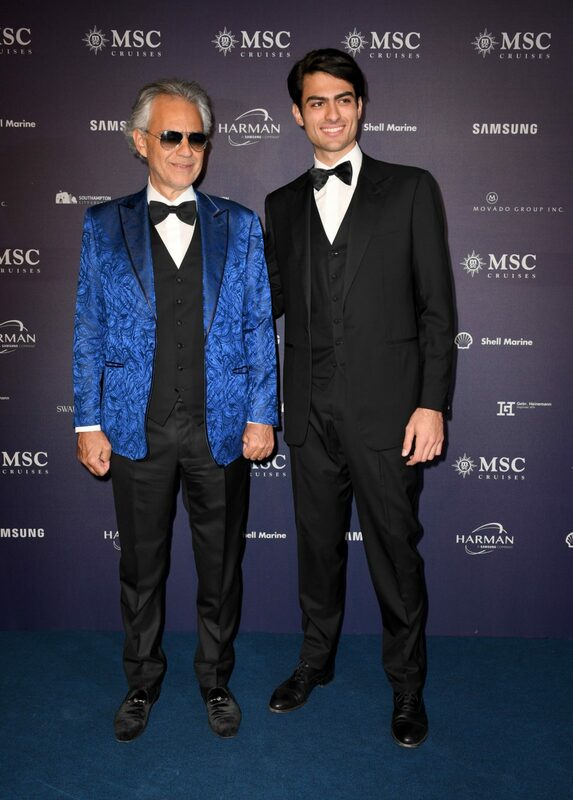 Andrea Bocelli stepped out with wife Veronica Berti to attend the naming ceremony of the MSC Bellissima in Southampton on Saturday night and the pair had all eyes on them. While Andrea, 60, has gone to many red carpet events, it was Veronica, 35, who stole the show with a very daring display. The brunette beauty looked stunning in a semi-sheer lace gown which was adorned with a silver leafy pattern all over. Visible underneath her saucy dress was a black bra along with a pair of black shorts. Veronica wore her hair in voluminous curls, and accessorised with a metallic bronze clutch and a simple silver necklace and earrings. While Andrea looked dashing in a blue sports jacket, which he teamed with a black waistcoat and trousers along with a bow tie. The opera singer married Veronica in 2014, who he shares six-year-old daughter Virginia with. He also posed for snaps with his son Matteo, who looked smart in a black three-piece tuxedo. It comes after Andrea finally released the official video to accompany the beautiful track, titled ‘Amo Soltanto Te’, which is on his most recent album Si, and features Ed Sheeran. Sharing the video with his fans on social media, Bocelli shared a link to the clip which has already been viewed more than 287,000 times on YouTube in the first 24 hours. The video focuses on a wedding ceremony, with a twist – all of the actors are children, complete with a young red-headed boy miming along to Ed Sheeran’s vocals, whilst a boy wearing dark sunglasses takes on the role of Bocelli. More recently, Andrea delighted fans by dueting with his son Matteo as they took to the stage at the San Remo music festival in Italy to perform their song ‘Fall On Me’ from the soundtrack to Disney movie The Nutcracker and the Four Realms. Are you a fan of Andrea Bocelli?